The E.M.S. Gallerie is proud to present the artwork of John McColgan. 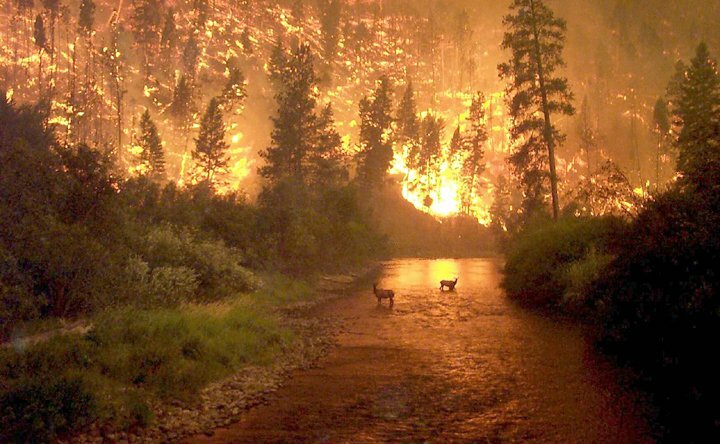 He was assigned as a fire behavior analyst in Montana this summer when he was faced with the best photo opportunity of his lifetime. The image was captured in the late afternoon of Sunday, August 6, from a bridge over the East Fork of the Bitterroot River just north of Sula, Montana. 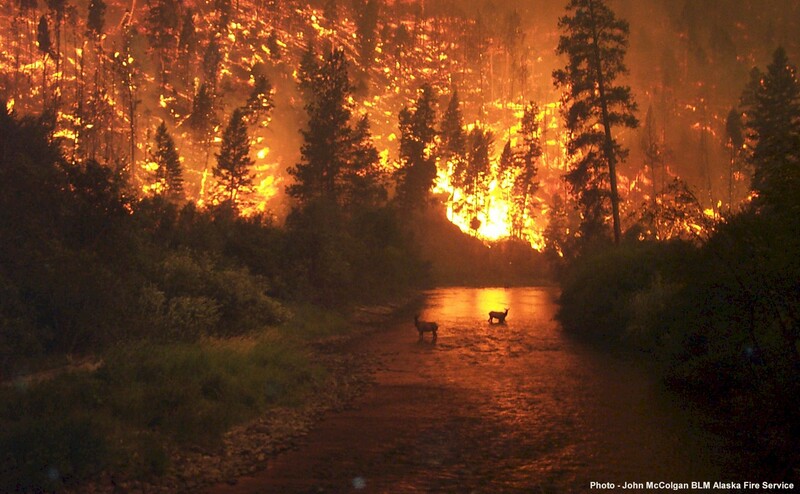 The elk sought refuge in the river bottom during what may have been the most extreme day of fire behavior on the Bitterroot in more than 70 years. "I do shoot some photography, but certainly that was a once in a lifetime, stunning opportunity." He was traveling to the Valley Complex along with the deputy incident commander of the Sula Complex. "I was on that ridge for maybe 15 seconds." "We just saw the elk, and I stopped and said, 'I'm taking 15 seconds here.'" McColgan said the photo does not fully convey the extreme weather conditions that day. "It was a fairly violent situation out there," he said. "It looks fairly serene, but the wind was really whipping." McColgan used a Kodak DC 280 digital camera, set at high resolution, but also at a medium to high level of compression to save on storage space. "I wasn't out shooting art photos. I was doing fire behavior documentation." After the photo was taken, it circulated widely and anonymously until it got picked up by the Associated Press and the Montana newspaper "The Missoulian." "I had given a copy to someone while I was down there [in Montana], and it inadvertently made its way into the e-mail system." He received e-mail from friends in Europe, sending the photo back to the US and asking him if he'd seen it. Although the photo originally went out with no credit information, a reporter from "The Missoulian" tracked the photographer down at home in Alaska. McColgan, who normally works as a fuels management specialist for the Bureau of Land Management Alaska Fire Service, doesn't mind the lack of credit, or that he can't use the photo to make a profit. John McColgan has been a wildland firefighter for 20 years. He currently works for the Department of Interior, Bureau of Land Management, Alaska Fire Service as a Fuels Management Specialist. John coordinates fuel management and prescribed fire activities for the BLM in Alaska. During fire season he serve as a Fire Behavior Analyst on the Alaska Type I Incident Management Team. John has been in Alaska since 1989 where he has worked with the Alaska Smokejumpers for 10 years. Prior to 1989 he worked on hotshot crews with the National Park Service in Sequoia-Kings Canyon National Park and with the U.S. Forest Service on the Mt. Hood National Forest where he started my wildland fire career. In 1987, He graduated from Colorado State University with a bachelors degree in Natural Resource Management with an emphasis in wildland fire science. E-Mail John McColgan for more info on her work and for details on how to obtain these images for commercial use or for your collection. E-Mail him for more info. Web page design and maintenance by Mitch Mendler E.M.T. Paramedic;The WebMaster! All aspects of this page are copyright © 1996 The San Diego Paramedics and unless otherwise stated are the property of the San Diego Paramedics .